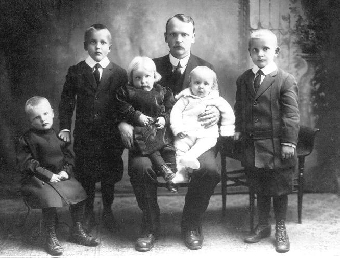 The five sons of Kalle and Edla are pictured below as children with their father and then about 45 years later at a family gathering at Neil and Georgina's home. from left to right: Eric, Norman, Neil, Karl, and Henry. Each person and each family will have their own recollections. Generally, the years following the Second World War was marked by the "baby boom" when people were looking ahead to prosperous times and a happy family life. 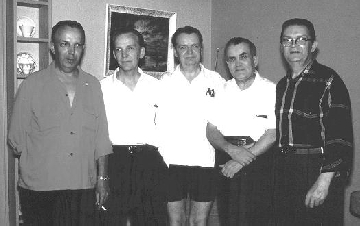 Because the Maukonen "boys" stayed in the Toronto area, they would get together on different occasions for summer family picnics and seasonal celebrations. As an example ... because Henry lived in the central part of Toronto and did not have a car, we could count on some of his brothers visiting on Christmas eve. The coffee pot would be on and the men would congregate in the kitchen speaking some Finnish interspersed with English words. The women would sit in the living room chatting about things that interested them. The children would play together or listen in to the adult conversation. On Christmas day, family would gather at Neil and Georgina's as Neil put on a fine spread of food which he had brought from the St. Lawrence market. Neil went into business with Chris Wahlroth and they had their shop in the King Edward Sheraton Hotel in downtown Toronto. Chris had a fine cottage, guest house, and sauna north of Toronto on a point of land between Moore's and East Moore's Lakes. There were occasions when the Maukonen "boys" would spend a weekend at the cottage. The wood-fired sauna would be heated and the men then took to the top benches. The lake was just outside the door for a cool plunge in the tradition of their forefathers. The brothers represented the cohesive bond for the family. Sadly, as they passed away, the cousins lost contact with one another.